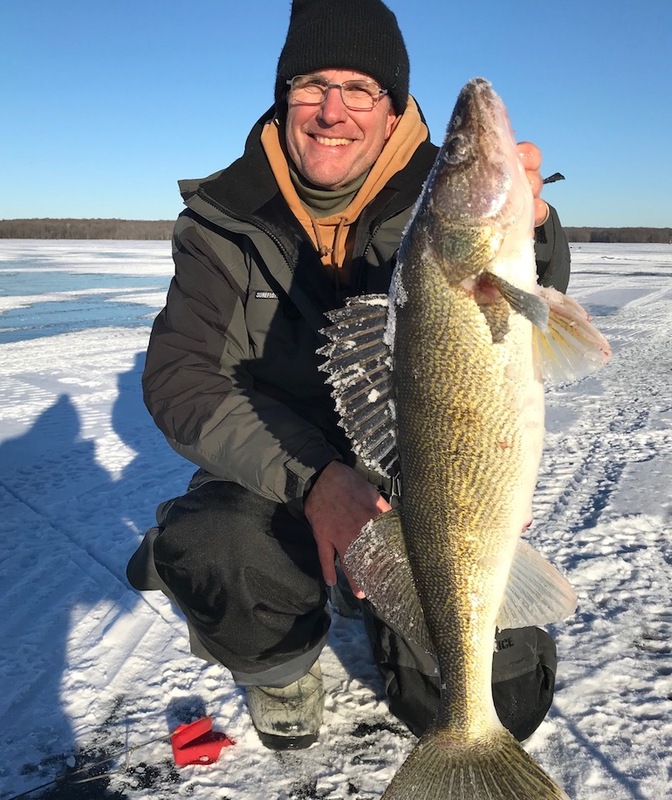 Here's timely advice from an expert ice-angler that is sure to help you ice more fish this winter. Fishing guide Phil Schweik of Hooksetters Guide Service (www.hookestters.biz) chuckled when I asked how he came into guiding anglers on the water and ice for a living. For greater recognition, Schweik began entering fishing tournaments. Success came slowly, but eventually he was taking the top prizes. He was able to leave his fulltime job at the paper mill and guide full time. Schweik also says lakes that may not fish well in the summer months can end up fishing great in the winter. This can be especially true in large reservoirs, where it seems like you have to cover a lot of water and end up trolling to find the fish during the summer. The fish are all spread out and can be anywhere. But come winter, the fish will school up and can be found around structure, if you know where the structure is. Contour breaks are other good areas to find fish. Schweik looks for these abrupt changes in contours by drilling holes and measuring the water depths. “I start at the shoreline and drill a hole, and say it is three feet deep. The next hole has four feet of water, the next one has five feet of water, the next one has ten feet of water. That is where the sharp break is and that is definitely one of the main places I am going to key in on. That's where I start fishing.” If there is structure along one of these contour breaks that makes it even more of a fish magnet. “If I forget my flasher unit, I will go home and get it,” Schweik said. He describes a typical day on the ice with this critical piece of equipment. When fishing a new lake, Schweik will study a map and look for areas likely to hold weeds. Then on the lake, he looks for where the weeds should be and drills the holes. Next he grabs the flasher and checks the depths from hole to hole. In the old days he would have to drop a string with a sinker on it to measure the depth. With the flasher, he also checks the contours, if there's weeds or structure and if there are fish holding in it. With the electronics he can see the suspended fish and what depth they're at. If he sees what he's looking for, Schweik will start fishing that hole. Without the flasher, it is just guesswork. Using the flasher unit, he watches his lure or bait going down and puts it in range of the fish. He can also view the reactions of the fish. Are they moving in or acting aggressive? Does he need to put the lure below or above them? What does it take to draw a strike? And, if he doesn't see fish for a while it's time to move on to another spot. Without the unit, we never would know if there were fish there or not. If the action slows down in one area, Schweik doesn't waste any time looking for another spot. He'll grab the auger and drill holes until he finds the fish. Schweik often fishes with other buddies, and they work in unison. He says a couple of them will start punching holes while the other guys follow behind with flasher units. They keep on until they find marks indicating a fish, and that's where they start fishing. 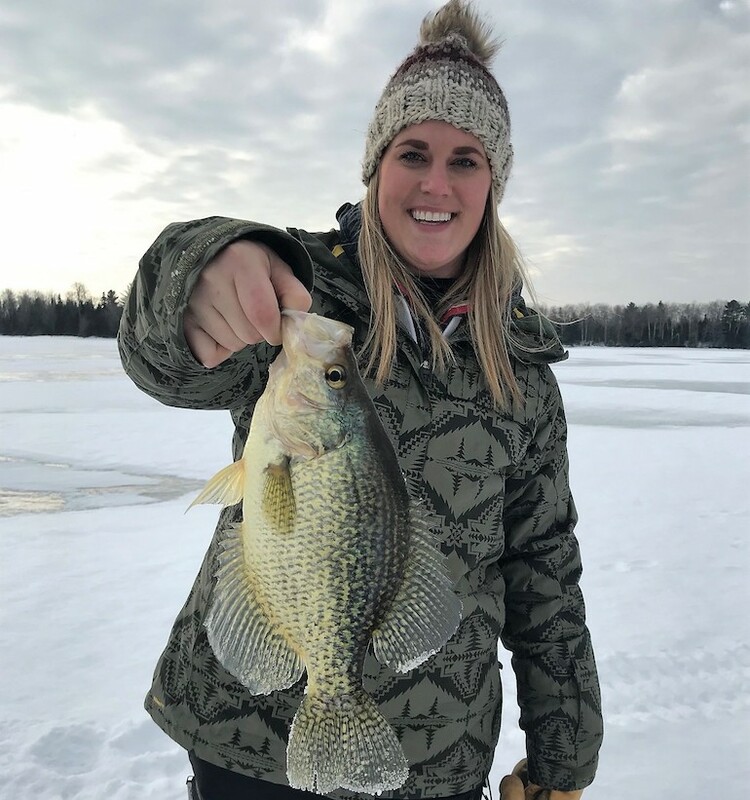 Just like fishing the rest of the year, techniques vary when fishing through ice, depending on what species you are targeting. Walleye fishing is usually better in low light conditions or at night. Schweik typically looks for walleye in about three to eight feet of water, depending where he's fishing. In a lake that is mostly sand and rock bottom, Schweik looks for the fish to be in areas with the transition of rock to sand. Also, he sets up over a little deeper water, perhaps four to eight feet, or even deeper if its clear. When fishing in a river system, Schweik looks for the walleye to be around mud and wood in very shallow water. When targeting crappie, he will usually go after fish suspended about four to eight feet off the bottom. They are often in 12 to 20 feet of water. Crappie come through in schools and Schweik waits for them in spots where there is brush or downed trees that he's marked with his GPS. As crappie move in they will hang out in these areas for a while, or stage, and then move on. Schweik recommends jigs tipped with wax worms, spikes or a small plastics, such as wedgetails for crappie or bluegill. 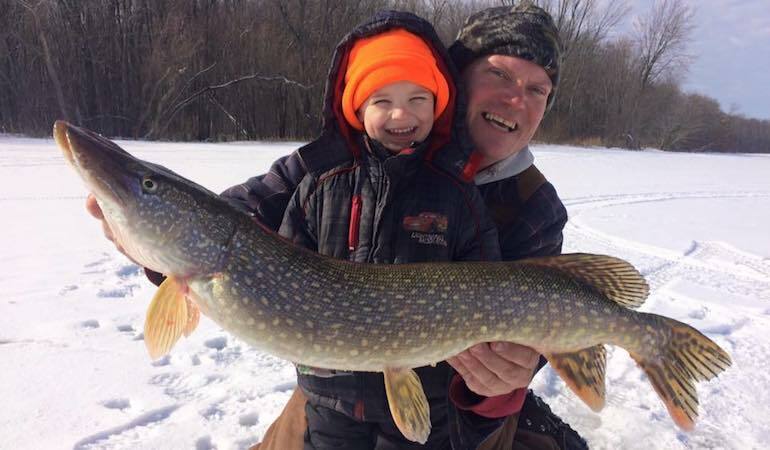 Northern pike usually have a daytime bite. The best times to fish for them is often in the middle of the day when it warms up, and especially when its sunny. Live golden shiners or fathead minnows are good options when targeting northerns, walleyes or catfish under a tip-up. 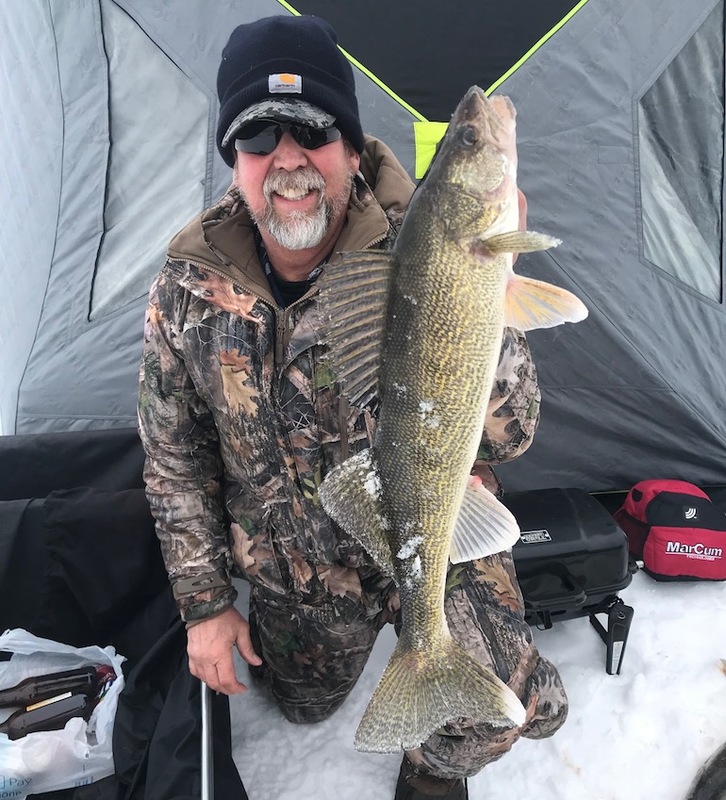 “First ice and last ice are always the best fishing,” says Schweik. He admits he really doesn't know why, but knows that when they get the first ice, everyone wants to get out and go fishing. 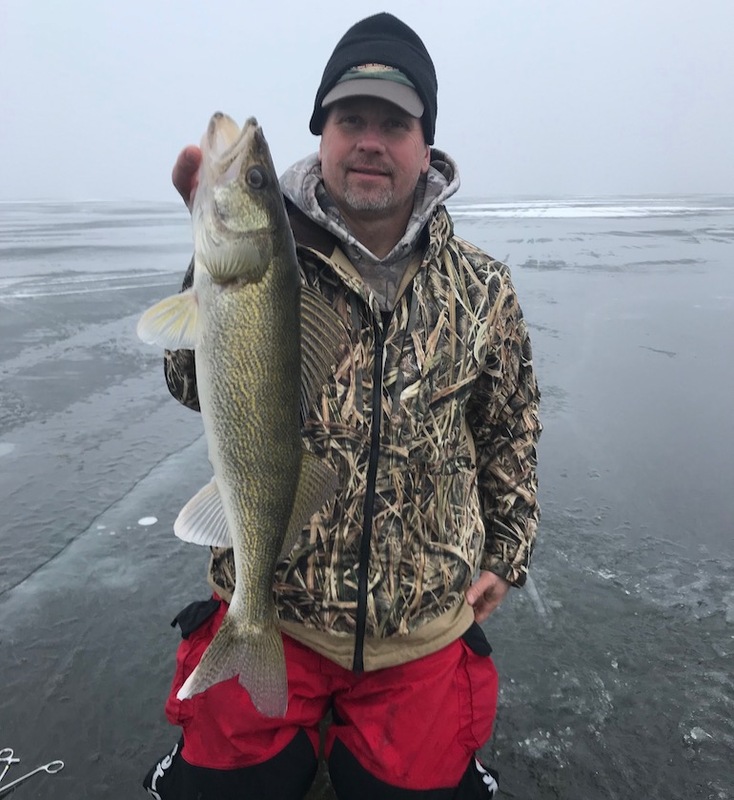 He suspects it's because the fish are still active with frigid temperatures just beginning to set in; and as the ice is forming on the waters, the fish haven't yet been pressured by anglers. For more information or to book a fishing trip with Hooksetters Guide Service call 715-693-5843 or e-mail pschweik@dwave.net.